Note: Version 2.x users can ignore this post. Some users may experience “hanging” of the QuickMove application after upgrading if they were on versions prior to 1.5.6. This appears to be due to the lowering of security rights for QuickMove to improve security. Files written under the older versions of QuickMove with higher security rights may be inaccessible by the new lower rights versions of QuickMove. 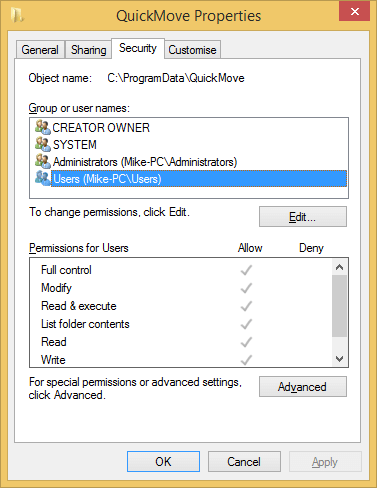 To overcome this, please edit your QuickMove folder and files under “ProgramData” to allow full access by “Users” as shown below.